This winery is owned and operated by generations of the Finkelstein family - Art, Bunnie, Judd and Holly. The family has been making wine in the Napa Valley since the 1970s. Art, Bunnie and Art's brother were the original founders of the Whitehall Lane Winery. That winery was sold in 1988 when production exceeded 30,000 cases a year. Judd's Hill was founded on the Silverado Trail on a 14-acre hillside property with the intention of limiting production to 3,000 cases per year. Art also makes small lots of wine for several customers through a business known as Custom MicroCrush. 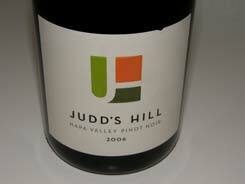 Known for their Cabernet Sauvignon, Merlot and Petite Sirah, Judd's Hill also produces an Estate and Central Coast Pinot Noir. An intimate sit-down tasting is available by appointment with Hospitality Manager Pat Burke (707-255-2332). The wines are available online.